Corbett was known as the “Lincoln Avenger.” Against orders from the Secretary of War, Edwin Stanton, Thomas P. Corbett executed John Wilkes Booth, the identical way John Wilkes[i] had killed Abraham Lincoln. The outline of his life below tracts an ignoble story that implies the reason he disobeyed orders. To others, the inconclusive end of his life led to alternate theories of his motives. In 1864, he re-enlisted in the 16th New York regiment. He met with Secretary of War Stanton and claimed Booth would have killed him if he did not defend himself. To top off the historical insanity of Corbett’s life, an imposter in Oklahoma attempted to gain Corbett’s military pension but was arrested and sent to prison. Years later, in 1905, another impersonator in Dallas claimed to be Corbett, also applying for his pension. He was detained, sent to jail and then to the hospital for the insane. 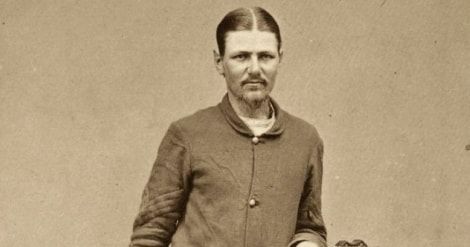 Thomas Boston Corbett died without, a penny, family, the pistol used to kill John Wilkes Booth or a monument to his passing. Kauffman, Michael W. American Brutus: John Wilkes Booth and the Lincoln conspiracies. New York: Random House Trade Paperbacks, 2005. [iii] Across from the Granary Burial Ground.